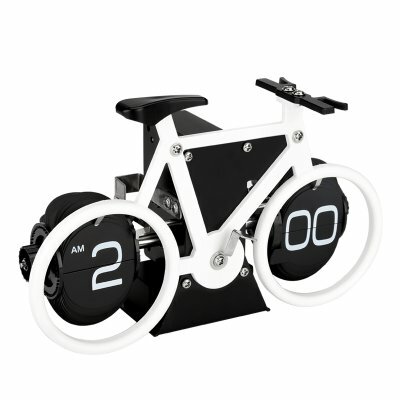 Successfully Added Bicycle Auto Flip Clock - 12 Hour Time Format, Quartz Action, 2 AA Batteries to your Shopping Cart. This retro modern digital auto flip desk clock lets you celebrate your love for cycling. Powered by two AA batteries (not included) this bicyclical clock boasts a classic design with the cards flipping over as time ticks by. The accurate quartz movement ensures great accuracy so you will never be late again. With a 12 hour time format the left hand hour display denotes AM or PM in the top left corner and with its large display with white digits on a black background it is clear to see and read the time from a distance. A true eye catcher this novelty designed desktop clock will accurate display time all day long and makes the perfect gift for any cyclist. This Bike flip clock comes with a 12 months warranty, brought to you by the leader in electronic devices as well as wholesale cool gadgets..